Metro Exodus will have levels 100 times bigger than those featured in Last Light. While the sequel will see a return to the series’ trademark tunnels, it’ll also dramatically expand its boundaries in the name of better exploration. The new level in question is The Volga, a region of Russia that incorporates the drainage basin of Europe’s largest river as well as a gaggle of bandits, a religious cult, and plenty of hungry mutants. We’re hoping Metro Exodus will earn a place on our list of the best first-person shooters on PC. You can watch the interview back on PCG’s stream. 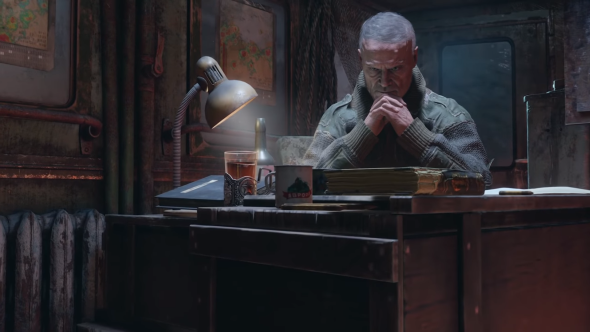 Creative director Andriy Prokhorov had previously told us that even Echoes, the level from Last Light built around a crashed plane, appeared tiny when the team overlaid one of Exodus’ maps. That’s going to have significant knock-on effects for combat – 4A has redesigned enemy AI to fit the larger Metro Exodus levels, causing baddies to wander freely and appear more frequently in certain biomes than others. For that reason, we should get a good variety of encounters while trudging east across Russia to find a new home for Artyom. Don’t go mistaking Exodus for an open-world game, though – it’ll still retain the linear story structure of the series so far. The design mantra for Metro Exodus has been ‘Stalker meets Metro’, which is terribly exciting, isn’t it? We’re looking forward to being able to stalk those levels at our own pace.